During my first year of Literacy Collaborative I was introduced to “Readers’ Statements”. They made a huge impact in my teaching, and carried over to writing, math, and science in my classroom as Writers’ Statements, Mathematicians’ Statements and Scientists’ Statements. A readers’ statement is basically a sentence or two that states what readers do. Notice I’m not saying “good” readers. As Peter Johnston writes about in Choice Words, (an absolute MUST READ, if you haven’t already) when we identify someone as a “good” reader, it implies that there must be “bad” readers. “It leaves open the question of who the bad readers are and how you can tell.” I think this greatly impacts the identity our kids have as readers. I want all of my students to see themselves as “readers” – not as “good” or “bad”. So I choose to leave any qualifier off and simply use the term “readers”. I use the readers’ statements as I plan my instruction, as I teach my focus lessons, as I meet with small groups and one-on-one with children, and throughout our day as I model what reading looks like and what readers do to make meaning from texts. Having a clear readers’ statement helps me stay focused on what I am teaching and allows the students to know what our focus is. When phrased in this way, “readers….” it helps students see themselves in the task. It creates an identity as a reader. They are readers (writers, mathematicians, scientists…) and this is what they do. I typically choose one or two statements each week or so to focus on. I write them on a chart or on a sentence strip and have them out in a place where we can see them and I can refer to them constantly. I plan this focus by looking carefully at my students and what they need next as readers. I may have one statement as our whole class focus that we look at through interactive read-aloud, shared reading and community writing. I then choose statements for each of my guided reading groups as well as the focus for my one-on-one conferences. Often, the statements I use in small group or 1:1 are ones we have used in the whole class that some students need additional time and practice with as they begin to internalize the strategy or skill we are focusing on. 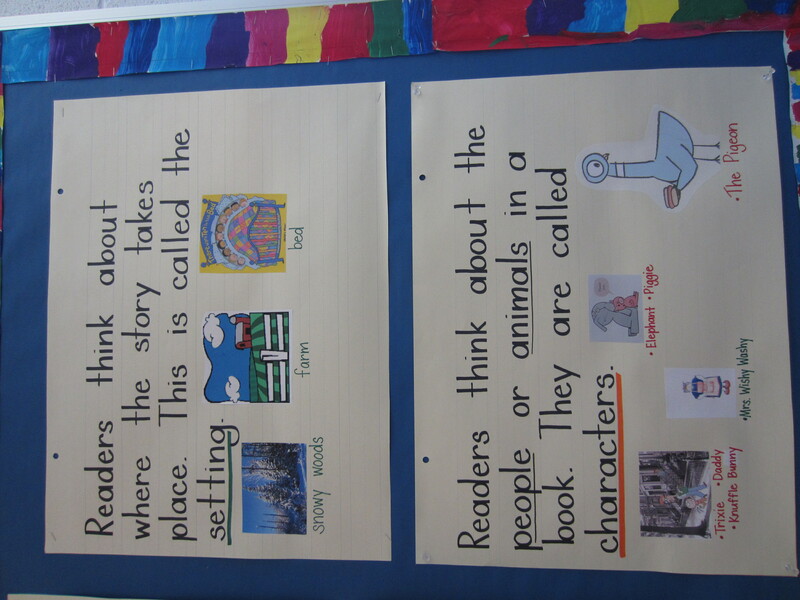 In kindergarten and first grade, I’ve found it’s very helpful to use the readers’ statements with photos to connect to prior learning and to help the children read and remember what our anchor charts say. Below are just a few examples of readers’ statements I’ve used this year. Take a look at your standards, the strategies you are teaching and what your students need next as readers to come up with your own statements. Readers think about what they read. Readers make sure what they read makes sense. Readers get a picture in their head to help them understand what they read. Readers notice that a book reminds them of something. Readers look for words they know in their books. Readers think about what the characters are feeling. Have you used readers’ statements? How do you see them supporting the readers in your classroom?